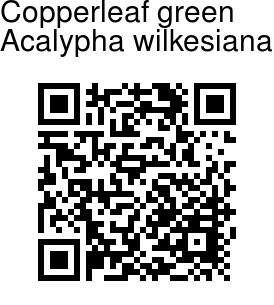 Copperleaf is a remarkable plant which has leaves that are more colorful than many flowers. It grows as a spreading evergreen shrub with upright branches that tend to originate near the base. It can get up to 10 ft tall with a similar spread. Alternately arranged leaves are elliptic to oval, toothed, 5-8 in long and multi-colored. The flowers are small and inconspicuous, in 4-8 in long, somewhat drooping, green racemes often hidden in the foliage. Many cultivars are available with different leaf forms and colors. Acalypha wilkesiana 'Marginata' has coppery-green leaves with pink or crimson margins. 'Macrophylla' has larger leaves, variegated with bronze, cream, yellow and red. The leaves of 'Musaica' are mottled with orange and red. 'Godseffiana' has narrow, drooping leaves with cream colored margins. Copperleaf is native to Fiji and neighboring South Pacific islands, widely cultivated in India. 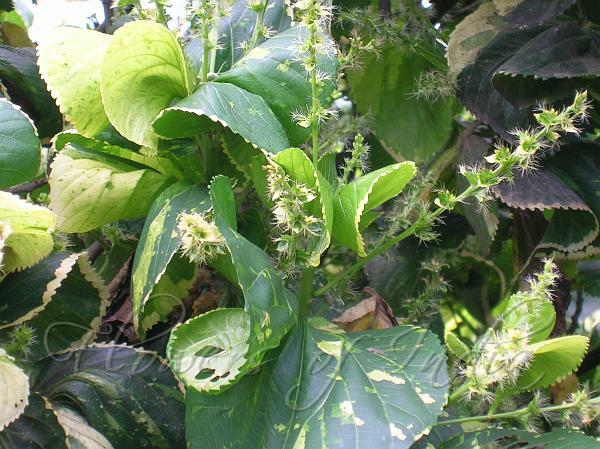 Medicinal uses: Acalypha wilkesiana ointment is used to treat fungal skin diseases. Identification credit: RK Nimai Singh Photographed in Jamia Millia Islamia, Delhi.